Looking "where to sell my Detomaso Pantera?" Ask the Chicago Car Club! Are you wondering "where to sell my Detomaso Pantera ?" The Chicago Car Club is interested in classic cars of all makes and models, especially a Detomaso Pantera. We make the process of selling your Detomaso Pantera quick and painless. In just a matter of hours we will have your classic valued and, if you do so choose, turned into money in your pocket. All it takes is a phone call or electronic inquiry to get the ball rolling. 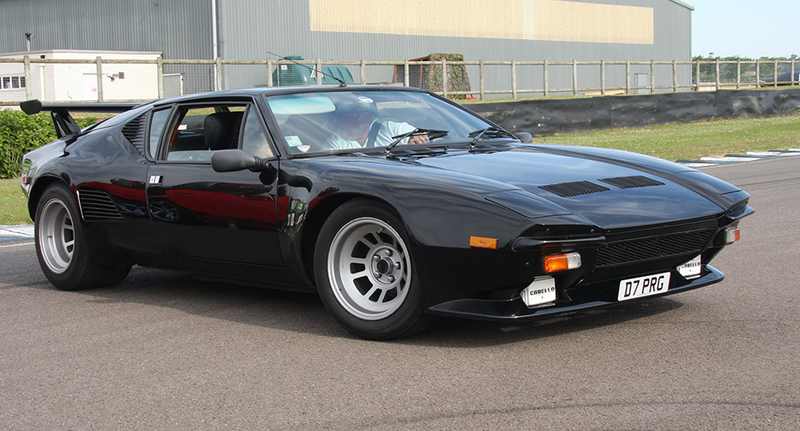 The Pantera was a mid-engined sports car produced by the De Tomaso car company of Italy from 1971 to 1991. Italian for “Panther”, the Pantera was the automaker’s most popular model, with over 7,000 units produced during its 20-year run. It was designed by American-born designer Tom Tjaarda for Ghia to replace the De Tomaso Mangusta. It had a steel single hull design, the first time De Tomaso used this construction technique. The Pantera made its public debut in Modena in March 1970 and at the 1970 New York Motor Show a few weeks later. A year later production was increased to three per day after the first production was sold out. The first 1971 Panteras were powered by a Ford 351 cu in (5.8 L) V8 engine that produced 330 hp (246 kW; 335 PS), for a speed of 256 km/h (159 mph). The high torque provided by the Ford engine reduced the need for excessive gear changing at low speeds making the car less demanding to drive in urban conditions than many locally-built competitor products. The ZF transaxle used in the Mangusta was also used for the Pantera. A passenger in an early Pantera noted that the mechanical noises from the transaxle were more intrusive than the engine noise. Power-assisted four-wheel disc brakes and rack and pinion steering were standard. The 1971 Pantera could accelerate to 60 mph (97 km/h) in 5.5 seconds. The American version had larger tail lamps and corner marker lamps. Conventional body-hugging sports-car seats were put in the production cars and leg-room was generous. The pedals were off-set and headroom was insufficient for tall drivers (more than 6 ft. or 183 cm.). Standard features included power windows, air conditioning and door alarms. Ford imported Panteras to sell in the American market through Lincoln Mercury dealers in 1971. The first 75 cars were simply European imports known for their “push-button” door handles and hand-built Carrozzeria Vignale bodies. A total of 1,007 Panteras reached the United States that first year. Ford increased its involvement in production of later cars by introducing precision stamping for body panels which improved overall quality. The 1972 Panteras had a new 4 Bolt Main 351 cubic inch Cleveland Engine with a lower compression ratio (from 11:1 to 8.6:1 to meet US emissions standards and run on lower octane standard fuel) but with the “Cobra Jet” camshaft (featuring the same lift and duration as the 428 Cobra Jet’s performance cam) to reclaim power lost by the reduction in compression.